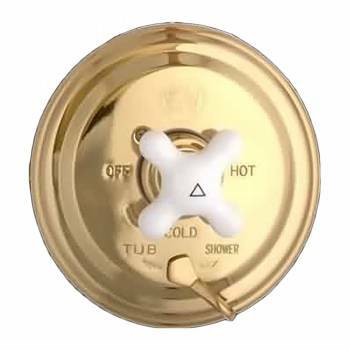 Durable solid brass tub sets? Temperature control, anti-scald, single-valve tub sets? Solid brass showerheads, spouts, & valves? The longest lasting, tarnish proof finish? If you've ever yelled "Ouch" because someone in the house flushed a toilet or ran water while you were taking a shower, read this! Single valve sets for tub and shower eliminate those sudden hot or cold surprises. 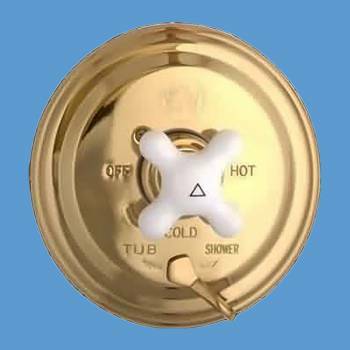 Pressure-balanced, with anti-scald valve to maintain even temperature. Includes shower head with flow control, tub spout, diverter valve, handle. Pan 7 11/16"; spout projects 6". Solid brass with Renovator's Supply Finish.